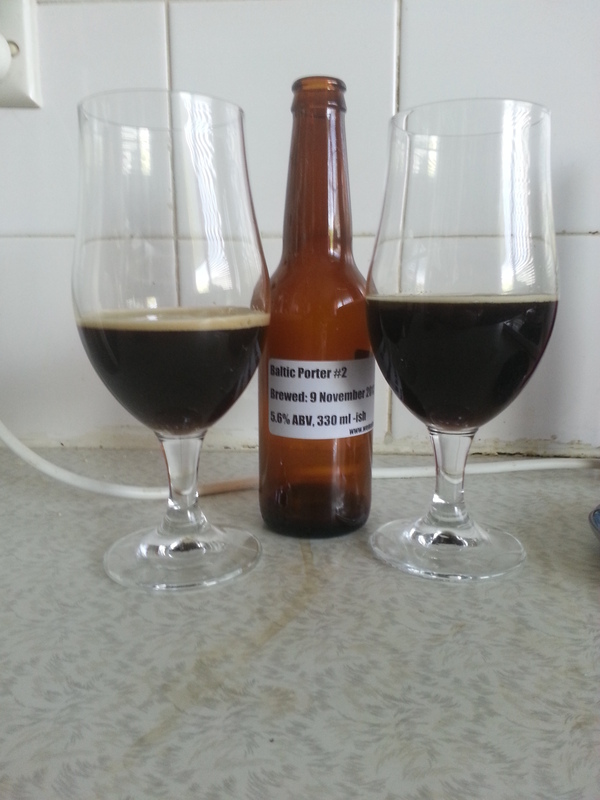 Last weekend Mikey had another brew day with a few tastes, one of which was a take two of the Baltic Porter, and it turned out quite well. The beer was intentionally lower in carbonation, as per the style, which was quite nice, felt good to drink and was nice to look at. The initial impressions of the smell were quite interesting. There was a bit of banana and yeast up front, which may be a sign of the fermentation being a bit warm, but it wasn’t an off putting smell at least. With the banana were hints of honey and a bit of apple too. This all interacted very well. The banana was a bit too up front, so if we try this again, I’d like to make sure the temperature is better controlled. Body was interesting and creamy, but a little bit confused. As a porter the beer should be a bit heavier, but there are a lot of lighter porters out there that are great. This beer couldn’t seem to make up its mind exactly how and where it wanted to sit in your mouth: it was heavy and light at the same time. This added an interesting, albeit a little confusing, element to the beer that I quite enjoyed. In regards to taste, there was a little bit of sourness in there that I usually associate with a stout, but it seemed to work well here. Fruit flavours continued throughout with a bit of sweetness as well. There was some hop bitterness as well, but it was well hidden; it could have been the Warrior hops pushing through as it really sat in my mouth after awhile. The hops were nice, but a little unexpected for the style. All in all, this was a great beer. A little confusing, but still nice to drink!